The last couple of months I have had to focus on getting a home built. It’s not finished yet, but it’s very liveable! Now it is back to the Domes. 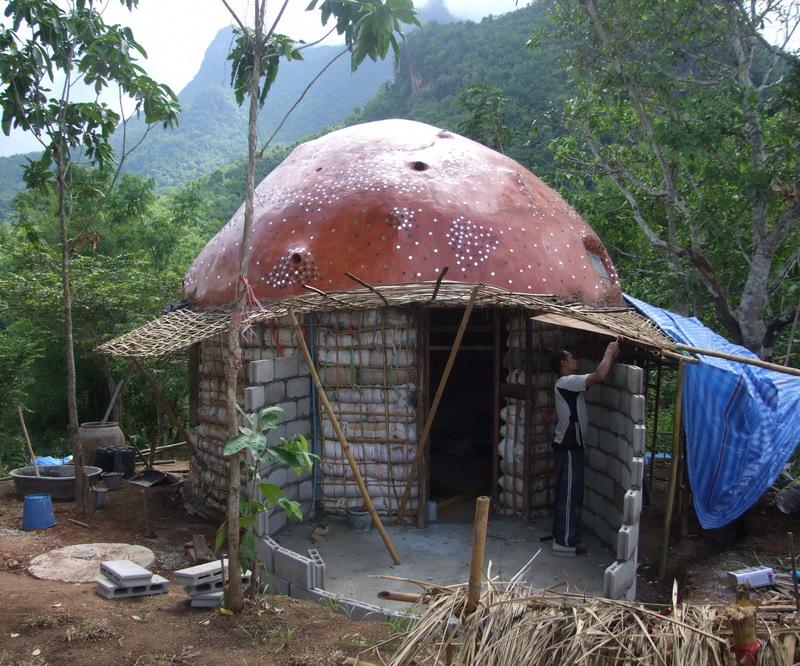 Where we left off was covering the domes with a layer of concrete. However, one layer was definitely not enough. I wasn’t expecting it to be, but was still a bit alarmed at how wet the bags of rice husks became inside the roof of the dome. In the first dome, the one that we had begun to plaster with mud and straw, lots of the inside plaster fell off. In the second, without any plaster, the wet bags made the room noticeably damp. Luckily it did not rain for quite a number of days and the mud and bags dried off beautifully. While the inside was drying out, we covered the top of the domes with plastic, then a layer of chicken wire, and then another layer of concrete. By the time the rain began again we had waterproof domes! A layer of plastic goes on the roof of the dome. You can see the chicken wire on top of the plastic, all covered with a layer of cement. The next step was to put the final finish on the domes. Mixing a colour roughly similar to the colour of the earth that will form the plaster on the walls, we used the same method as the floors in my home. Only this time we added some ‘stardust’. Little 1” x 1” mirrors and blue glass pressed into the final coat of polished cement. The top of the dome is finished with a couple of layers of polyurethane. I expect this will have to be done every couple of years. The top of the dome is finished. From the picture above you can see bits of bamboo sticking out from just under the cemented bit of dome. 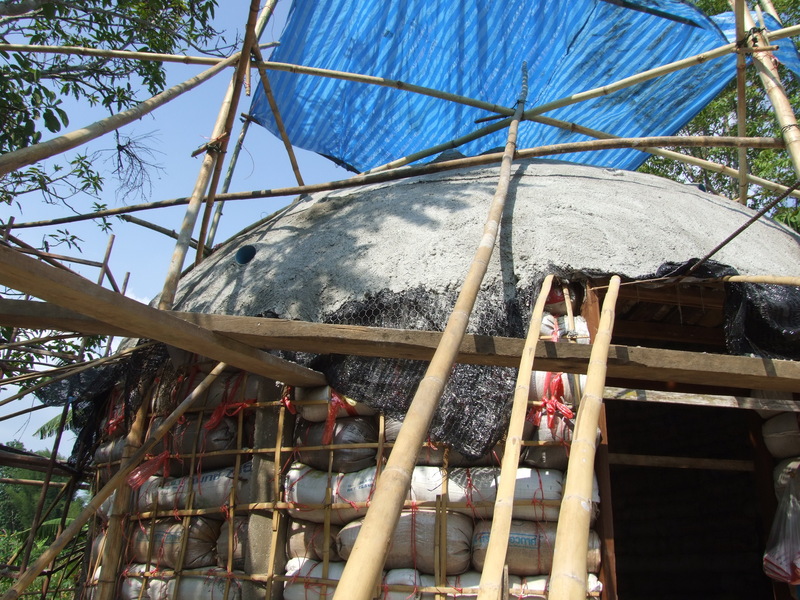 This is in preparation of an eave, to protect the inside of the dome from the hot midday sun, or the monsoon rain. 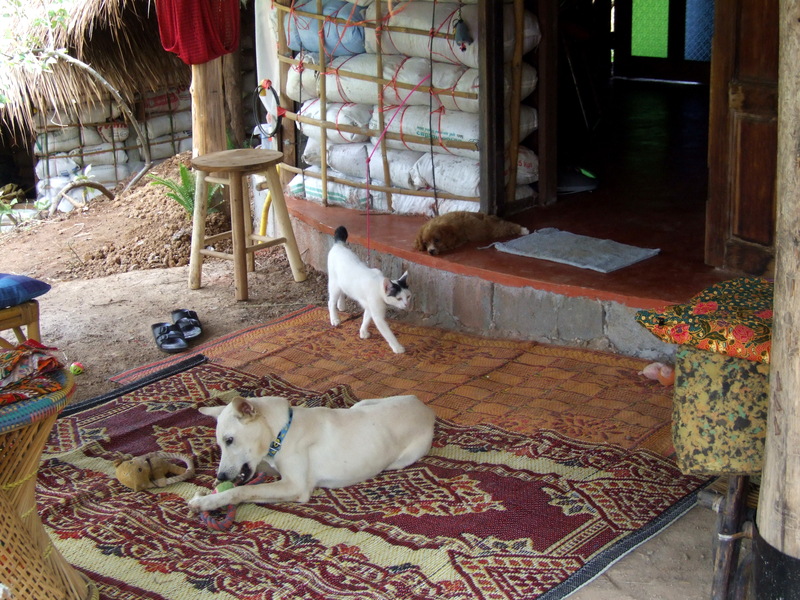 In the picture below you can see that more bamboo has now been woven into the eave. Working on the woven bamboo that will form the base of the eaves. The next step is to add some reinforcing steel to give the eave(s?) the shape I wanted. Then plywood was put underneath as you can see in the background of the picture below. 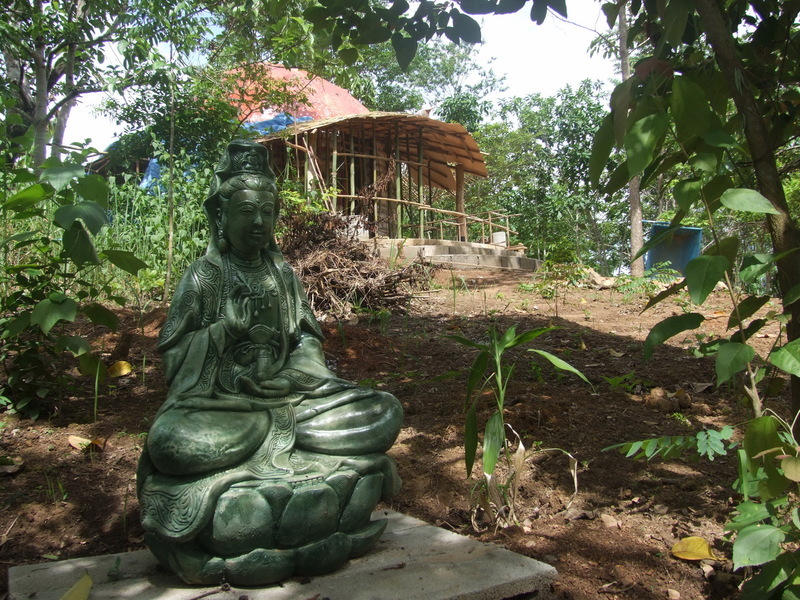 Kwan Yin, the Goddess of Infinite Compassion, has a home in the garden. 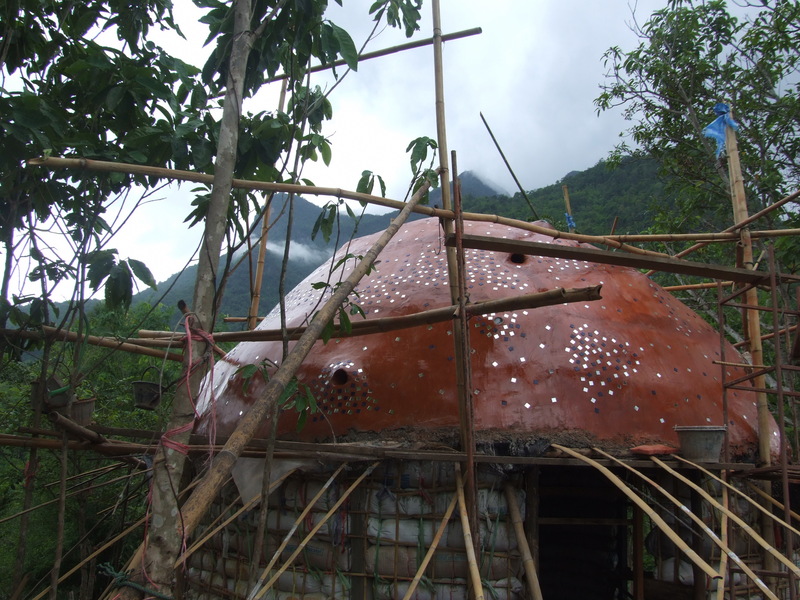 The eave over the porch in the front of the dome is supported by two second-hand teak posts. The eave begins to get its shape. At the back, the bathroom will be supported by a semi-wall. The bathroom will have a half roof, so that you can have a shower out in the open, under the sun and the moon, or under the roof if you prefer. The wall is dotted with bottles, cut short, joined together with tape, and inserted into the wall, bringing more light into the area. Half the bathroom wall has been plastered. The monsoon is really setting in and I am worried that the swimming hole will fill with earth. So as we now have two waterproof domes, we are taking a week off from domes to get the plastic lining into the natural swimming pond – next Blog! 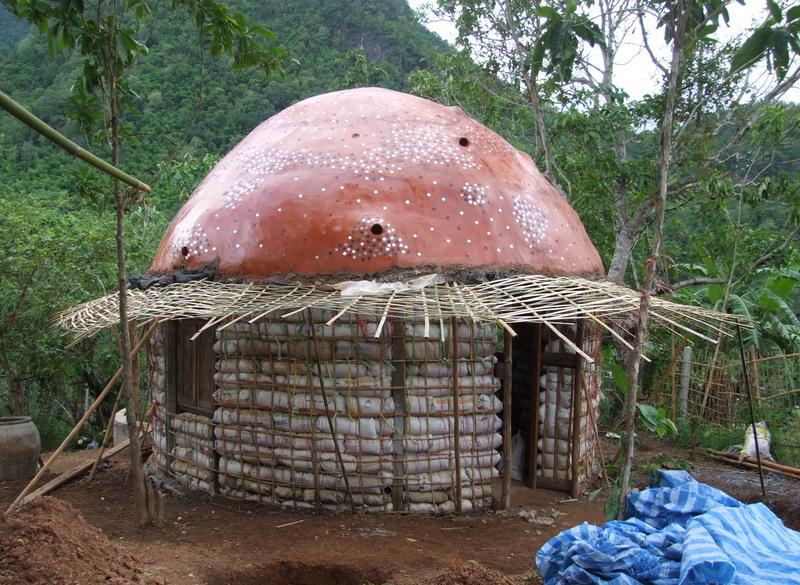 This entry was posted in Natural Building and tagged domes, rice husks. ← Sleeping in a Roundhouse Bedroom. I am truly amazed. 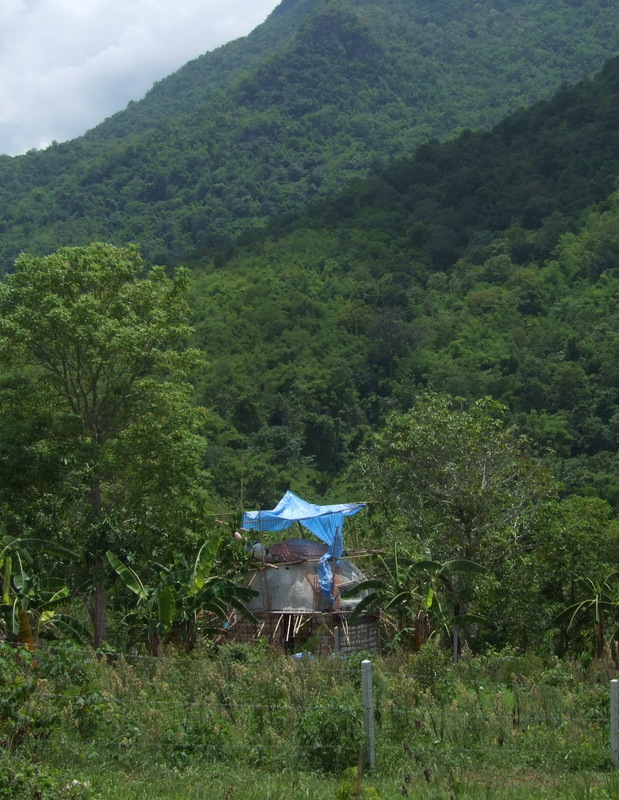 I live in Chiang Mai and would love to come up to Chiang Dao to see these natural buildings. You would be welcome to come and visit. Let me know when you can come. What did you use to finish the walls and floor of the shower? Is it just poured concrete? 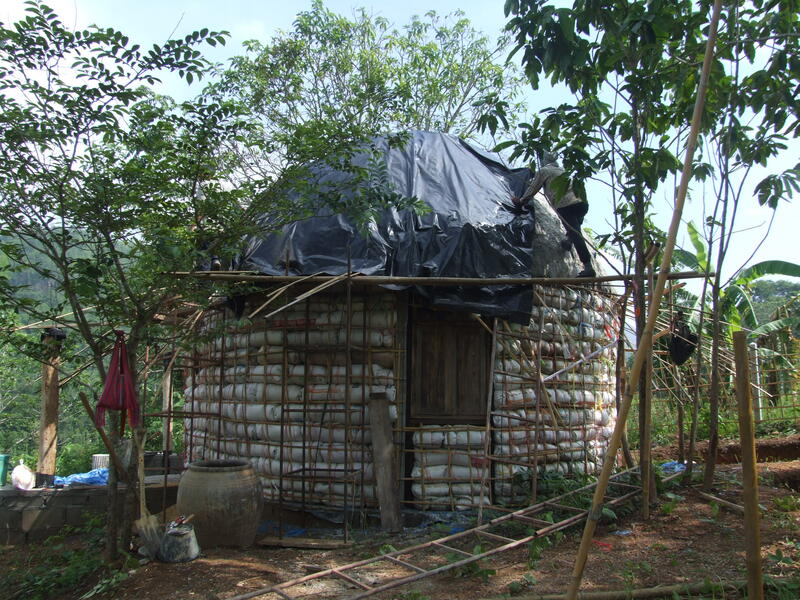 I’d love to do this, and am planning to build a hiperadobe house lined with rice husk bags. Would love to create a shower like yours! It’s beautiful! 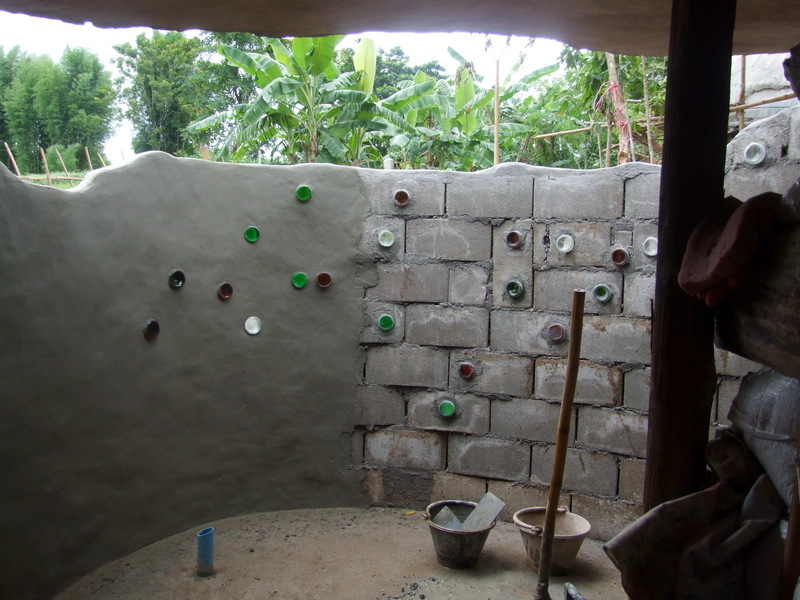 As the shower room was partially outside, and we have monsoon rains here, the walls and floor are of concrete, but hand made without using machines. 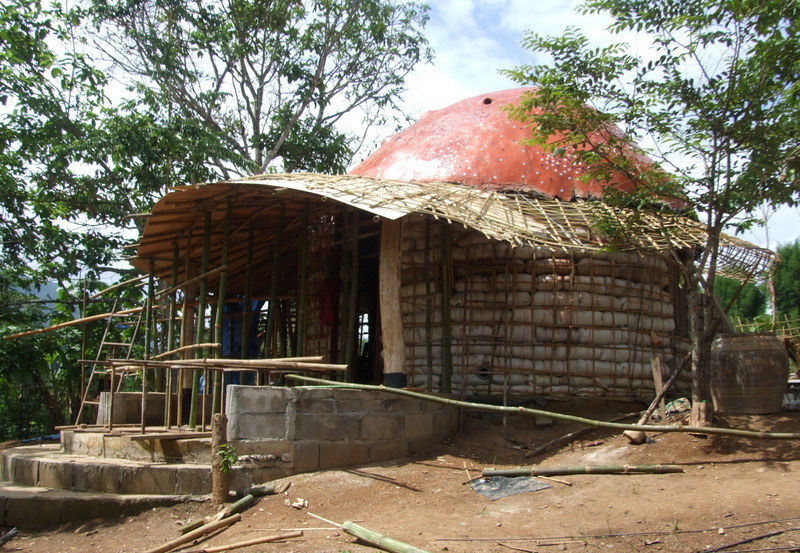 The floor is strengthened with bamboo over which the buckets of concrete are poured, the same as the floors of the roundhouses. The walls are concrete blocks with holes made for the bottles. However, we have now done a small piece of wall with bottles laid in concrete which looks great – the bottles can be much closer together. This will be on the blog soon. Are you going to make a blog of your building? I would love to follow you. Please let me know. And if you have any questions, I am happy to answer them – if I can!